You could spend a lifetime touring the beautiful cities and towns that are dotted around France. From the wonders of Paris to the charms of the smallest villages, it’s a country that never fails to impress. In this post I want to take a closer look at one of the parts of the country that commonly comes up as a desirable destination, but still seems to be overshadowed by larger cities and more famous regions.Aix-en-Provence is a relatively small town in Provence-Alpes-Cote d’Azur, with a population under 150,000. It’s sometimes referred to as a university town, not because of any single college but because of many educational institutions that have popped up over the years. It’s also a very picturesque city, located about 30 miles north of Marseille near the Mediterranean, and even closer to Étang de Berre, a large lake barely cut off from the sea. It makes for a lovely stop on any tour of the south of France—thanks in large part to some of the following sights and activities. Visiting Aix-en-Provence, the local markets should be a high priority. It sounds cliché to suggest that you have to get out into the markets to connect with the culture of the town, but here that’s truly the case. Le Grand Marche isn’t a single market but rather a series of different markets that pop up in the main city squares on a few scheduled days each week. You can buy everything from souvenir trinkets to fresh produce, but it’s more about walking around and getting a feel for the atmosphere. One of the main points of pride in Aix-en-Provence is that it was the home of Paul Cézanne, one of the most famous painters of the 19th century. He was inspired frequently by the scenery surrounding the town, and did most of his work in this little studio. Supposedly it’s been painstakingly preserved so that it looks about the same way it did at the time of the artist’s death. It’s a quick stop as there’s not actually that much to do or see. But if you happen to be a fan of Cézanne’s, or great painters in general, it can be quite an experience to see the space in which the man actually created most of his greatest works. Purely as a geological structure, there’s nothing particularly remarkable about Mont Sainte-Victoire. It rises up a short distance east of the main city, and at times looks like an unremarkable rocky ridge. But at the right time of day, and from the right angle, it takes on a whole different look. The mountain is primarily limestone, and the surface can effectively glow in pink and orange hues in the right light—which is one reason it was one of Cézanne’s favorite inspirations. You can hike the mountain on your own, though be sure to check on conditions. One guide points out that access to forested areas is regulated due to fire risk at hotter, drier times of year. This is the name of the local casino, and it’s made an interesting play to attract the attention of potential guests. Characters and stories from pop culture tend to dominate the casino gaming scene these days, at least online where we find so many popular slots and jackpots. Pasino seems to have taken note, and uses similar animated characters on its website to demonstrate games, almost giving the impression that it’s an online gaming site itself. But rest assured this is a very real casino, complete with plenty of games, terrific restaurants, and its own performance hall. It’s one of the more enjoyable nights out in Aix-en-Provence, and truly one of the best casinos in France. Typically I might want to point to a particular restaurant or cluster of bars to target on vacation somewhere. But like a lot of university towns around the world. Aix-en-Provence is better known for a whole neighborhood than for any particular establishment. Le Cours Mirabeau is beautiful street full of interesting places to grab a meal or a drink. It’s particularly magical at night, when bright street lamps and the canopy of trees overhead make it feel at once exciting and intimate. 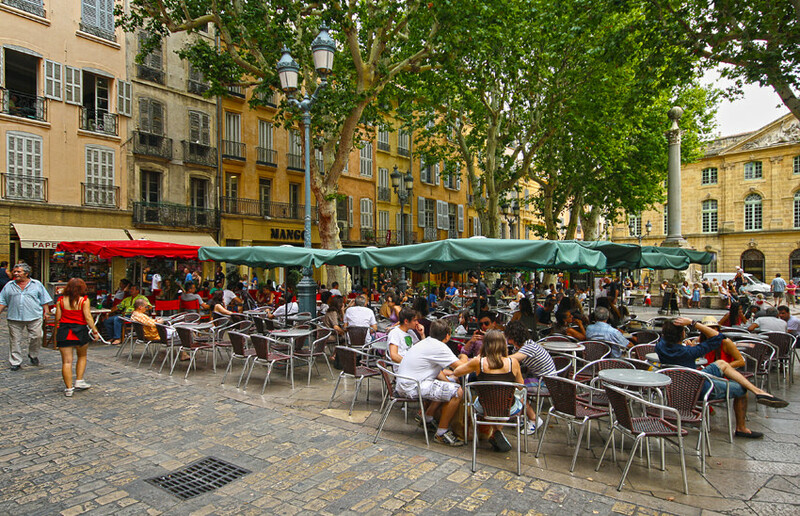 These are a few of the places you should be sure to enjoy if you get the chance to visit Aix. That’s to say nothing of the nearby lake, the close proximity to Marseille, and of course the Mediterranean Sea beyond. It’s a lovely destination, particularly if you’re just looking for a way to relax in the south of France.